We live in an innovation era. Companies resemble a huge “workshop”, where prototypes and new products are created at a dizzying pace. Agile is a methodology that suits its name – created to satisfy these dynamic business needs. But what is the meaning behind this term and how does it affect the work environment? The projects of Allegro (Warsaw), Nordea (Gdynia) and Deutsche Bank (Frankfurt), where we have developed 3 generations of agile workplace, will be the model for answering these questions. Agile methodology is an iterative process that allows a company to change both the business environment and its internal structure. Because the agile culture is all about change. People and interactions instead of processes and tools – a team is based on exchange of knowledge, and an employee has greater freedom but also responsibility for the performed tasks. 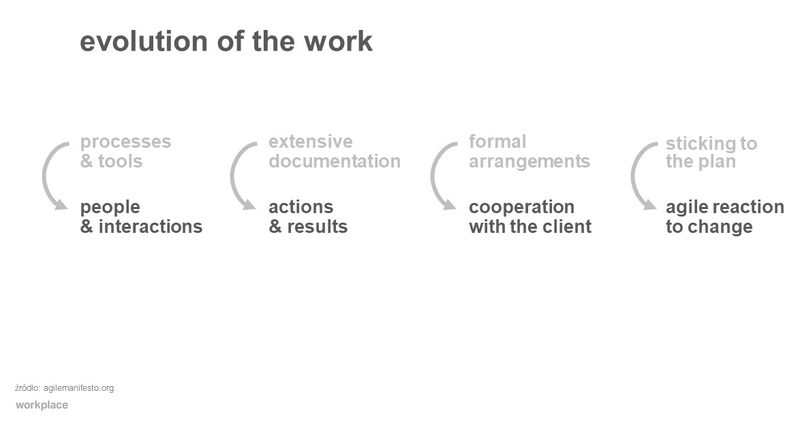 Actions and results instead of extensive documentation – work involves the search for innovative solutions: trying out and testing ideas, often skipping unnecessary formalities that slow the entire process. Cooperation with the client instead of formal arrangements – the involvement of both sides (client and supplier) in the design process. This makes it possible to exchange information on an ongoing basis in order to allow the creation of a product that corresponds to real, ever-shifting needs. Agile reaction to change instead of sticking to the plan – the identification of flexible assumptions and goals as well as their ongoing verification in order to react to unexpected situations in an efficient manner. The main challenge in terms of the implementation of these assumptions is the creation of a culture of exchanging information and enabling the performance of various actions – individual, creative work as well as internal or external cooperation. Contemporary agile employees need a work environment without barriers, flexible enough to cater to their need for movement, daily meetings with the team, spontaneous interactions and opportunities to focus. A simple and popular metaphor may be one of a sandbox, or rather a playground. Everyone finds a place for themselves, joins a “pack” and cooperates with it in accordance with the principles and the daily plan agreed by its members. They define their own space and share it equally. Fluidity and ease of movement, freedom in placement selection; a lack of spatial limitations naturally stimulate creativity, imagination and mental comfort. These are the key elements of work environments for programmers designed by Workplace in previous years. However, with each successive project we observed how the demand for flexibility increases as technology develops. The employee’s presence in the office resembles a sine wave – it is constantly changing and it is hard to predict. It has a direct impact on the evolution of workspace. What does it look like in practice? The Workplace team managed to develop 3 various generations of agile workplace inspired by agile guidelines in close cooperation with the client and reacting to changes. The first was designed in the Allegro company. The largest e-commerce platform in Poland. Their programmers have been working in agile for many years but new spaces require new, flexible solutions to enable better communication and space “fluidity”. After the research process it became obvious that the most important issues to be taken into consideration are the sizes of individual teams, their mobility and changeability of tasks. The most effective number of people in a team is 4-7. Much scientific research confirms this, as does the famous Two-Pizza Rule by Jeff Bezos. The rule applied by the Amazon CEO was meant to foster the creation of an innovative workplace in order to maximise support for creative thinking and quick decision-making. In Allegro, the space for teams must be ready for fluctuating numbers of staff – individuals constantly move between teams. For each team, similar-sized home zones were designed, ready to host between 6 and 12 people. 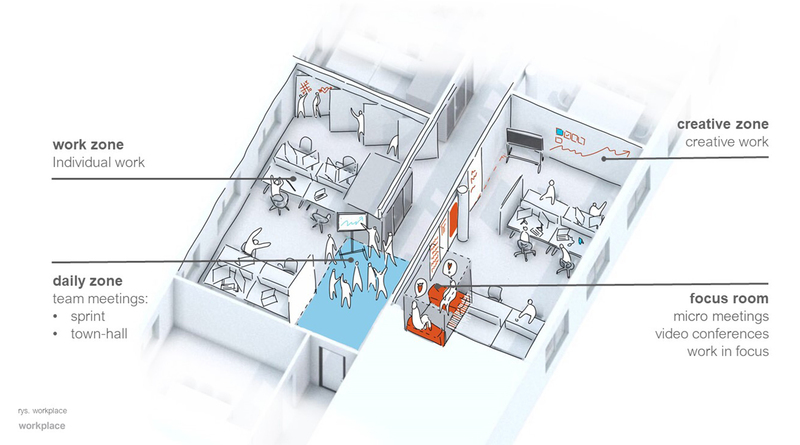 They are separated from the corridor with a glass wall and internal daily zones neighbouring individual workstations in order to allow for the quick exchange of information during a morning sprint. The focus room is next to it. Each team also has a meeting room for 8 people. The evaluation yielded interesting findings. 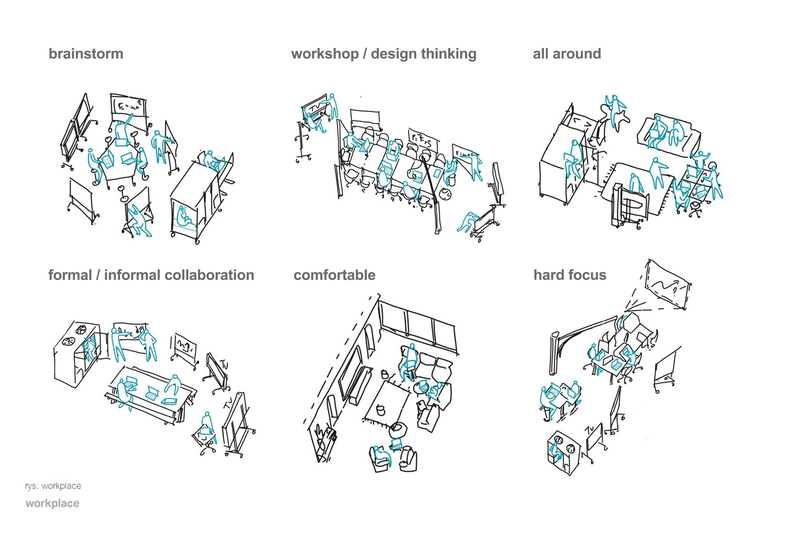 The pace of change in the agile environment necessitates a buffer in the home zone – a free space which may be adapted, for instance, with an additional desk, a micro-workshop zone or a narrative element that reinforces team identity. In the case of some teams an increased demand for isolation was found – acoustic or psychological. It indicates that such solutions from the corridor side entry should be considered as well. We have also learned that sometimes the creative zone and the daily zone both tend to be too small when a simultaneous sprint of two teams has to take place. Therefore, these places must be even more flexible and mobile. The next evolution of agile workplace was a challenge of a much greater scale. Over 15,000 m2 of new quality workspace for programmers working for the Nordea group made it possible to develop and test new functional arrangements based on conclusions drawn from the evaluation workshops regarding the earlier project for Allegro. 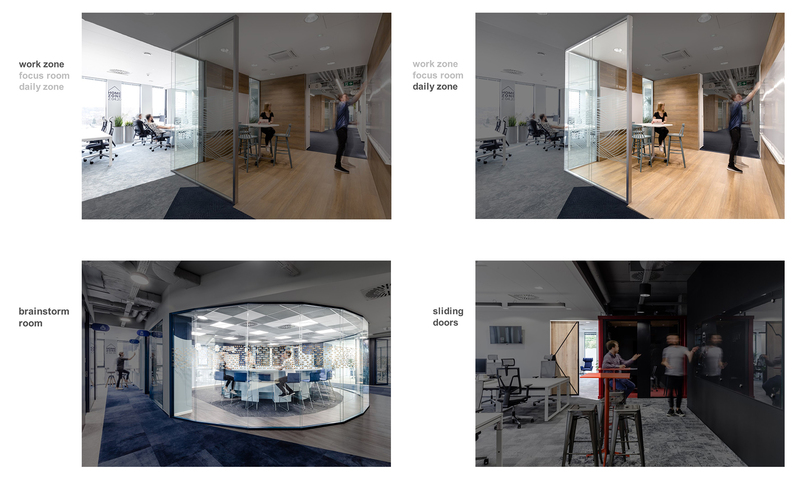 We introduced two main differences: we have designed sliding doors between the home zones which make the office space more open and transparent, and the teams which are more in contact with one another have a shorter direct communication route. The second measure involves daily zones facing towards the corridor. They are not assigned to particular teams and, most importantly, have varied sizes. 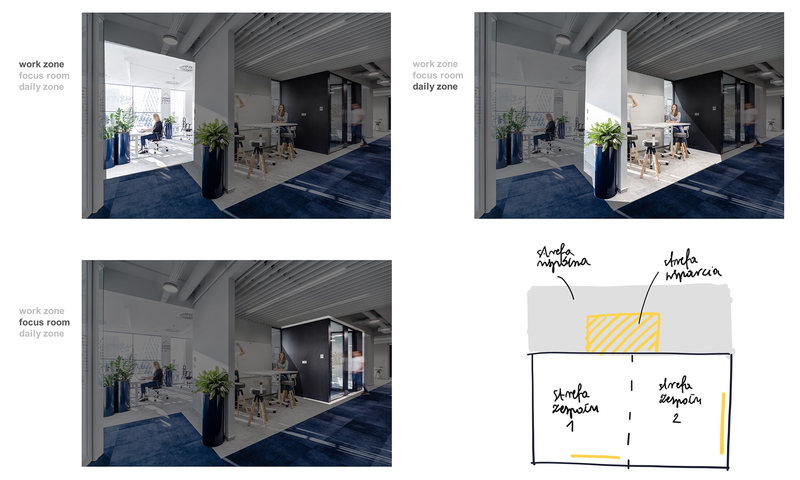 They are half-open, connected with a corridor, placed near the workzones but separated from them partially or entirely with a glass wall and furnished with an up & down type table as well as a dry-wipe board. There are shared focus rooms adjacent to them. After implementation of the second generation we know how important it is to manage change in a differentiated agile environment. Communication about specific solutions and how to use them is a key condition for the success of such an environment. In some zones there are no screens present. During discussion on the given process, the employees indicated that the screens are key given the character of the daily/sprint meetings. Just like individuals, teams have various needs – some like the solutions implemented in the previous agile generation, some are more content with the new ones. Varied solutions should be designed on floors and places with a varied character – flexible and with a variable function. Freedom of choosing the workplace and the possibility of transforming the given space makes people want to stay there. The latest agile space type was designed outside of Poland in cooperation with our German partner, Working Well. The design for Deutsche Bank in Frankfurt was the third generation based on maximum flexibility and mobility. Workspace for German agile teams has a much more crude and garage-like character. Apart from a “start-up” character and the flexibility of this space, there is the sense of an overarching rule which should be adhered to. Everything is carried out according to a predetermined pattern. The work is choice-based. We choose where we want to work. Apart from mobile workplaces, boards and monitors, less formal meeting places must be mobile too – tribunes, sofas and even phone booths should be ready for quick rearrangement. In the home zone, 10 to 12 people who often change places have their workplaces. The daily zone is not only a zone connected with the work zone. 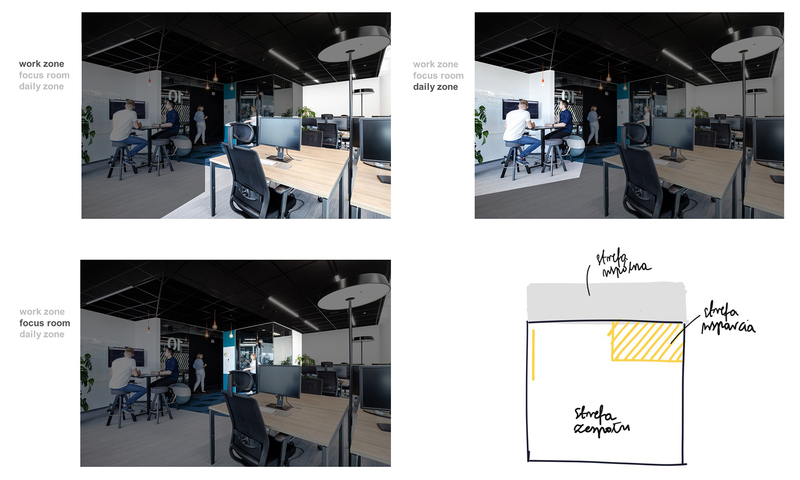 It also involves shared, closed rooms for brainstorming, equipped with mobile boards, dry-wipe boards or, very importantly, they are ready to be fitted with a mobile board or a screen. After these creative meetings, boards are returned to the work zones along with notes and arrangements. 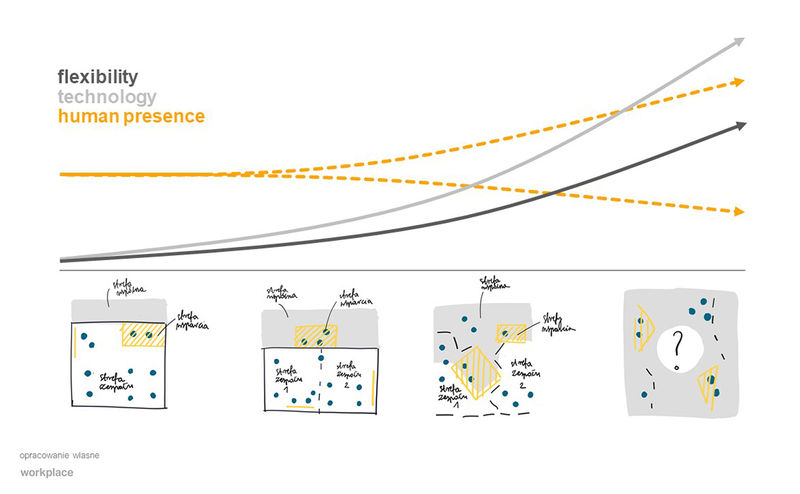 The transparency of 3rd generation agile spaces results from the workplace culture – it is transparency on a spatial and sociological level, but also in terms of space optimisation. Mobile walls are obligatory elements – we have curtains instead doors. It is safe to assume that agile methodologies are a great answer to the changes in the market of new technologies. Is it possible for other sectors to benefit from the experiences developed in this sector? Our research and observations demonstrate that this is the case. The number of techniques based on the Agile Manifesto developed during the last 20 years makes one wonder whether it is really the future of workplace culture and environments. We often hear about implementation of the agile methodology in marketing, banking or creative sectors; and an experimental project of using this strategy in church non-profit organisations only confirms that this concept is so flexible that it can be implemented in any environment – even in a sandbox. 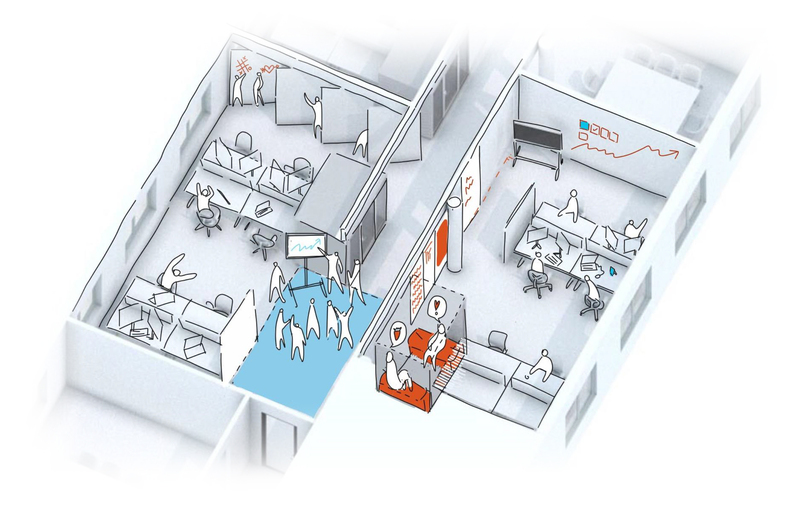 Therefore, what will be the profit and loss of transforming the workspace to agile? Better employee focus. Daily sprints make employees more involved in a single project and encourage them to set goals for themselves on an ongoing basis. Spaces for individual and team work give one a choice of workplace depending on the given activity. Increase in the flow of knowledge and improvement in internal communication. Semi-open, diverse space, functional solutions that facilitate frequent team meetings – they make communication more effective and enable progress tracking. Creativity and trust in a team. It is partially an advantage of cooperation zones, partially of a place ready to be transformed according to the team’s preferences. An agile culture and space foster innovation. Increase in client’s participation in a project and increase in satisfaction. 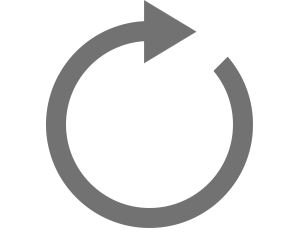 You provide a much more comprehensive product – the result of constant evaluation. These are the core advantages of implementing an agile workplace culture. However, it should be borne in mind that only skilful shift management, communication about the utilisation of space and thorough understanding of the needs of a specific organisation will make an agile workplace successful. We may wander how technology will develop workplaces and whether the employee of the future and their work will be entirely virtual. Agile spaces will evolve further to shape the offices of the future – they will be more flexible and more adapted to human needs. Currently, Workplace attempts to develop several even more mobile agile workplaces. The fruit of our labour and first conclusions will be presented in 2019.